N-Propyl Bromide, Propyl bromide - Mody Chemi-Pharma Pvt. 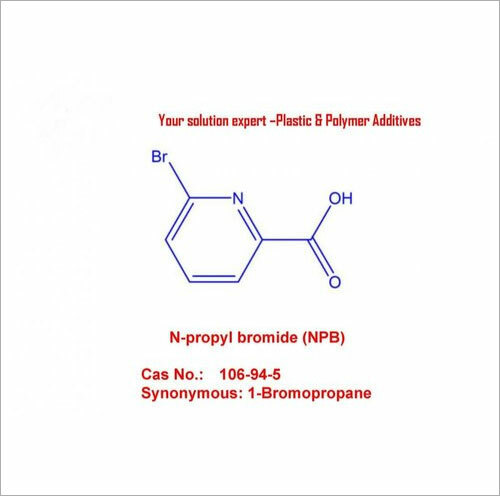 Ltd.
N-Propyl Bromide is also known as Propane, 1-bromo-, 106-94-5, N-Propyl bromide, Propyl bromide, bromopropane, 1-bromo-propane with Molecular Formula of C3H7Br and Molecular Weight of 122.99168. It is manufactured through condensed, neutralized and fractionated process and is available in form of colorless liquid when fresh with Boiling Point of 71°C at 760 mm, Melting Point of -110°C, Density/Specific Gravity of 1.353 at 20°C/20°C and Octanol/Water Partition Coefficient log of Kow = 2.10. Further, it has solubility in ether, benzene chloroform, acetone, ethanol, carbon tetrachloride as well as in water (2,450 mg/L at 20°C).